Urgent! 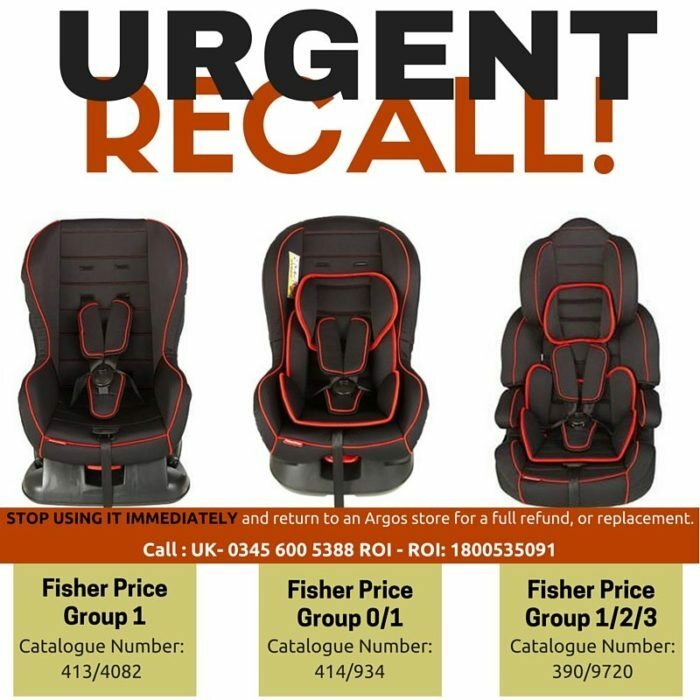 Recall of Fisher Price Car Seats! Fisher Price have issued an urgent safety recall of these car seats (picture)! If you are using any of these car seats, you need to STOP using them this instant! We have identified a potential safety issue with Three Fisher Price Car seats. The safety restraints do not fully comply with our test requirements and could compromise child’s safety in the event of an accident. If you have one of these car seats, please STOP USING IT IMMEDIATELY and return to an Argos store for a full refund, or replacement. We wish to thank you for your cooperation and apologise for any inconvenience. and they will be happy to answer your questions. I can’t stress enough that this is an URGENT safety recall and it’s vital that you take heed from it if you own one of these car seats!